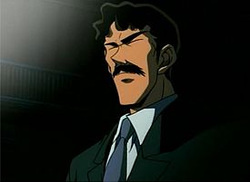 Heizo Hattori (服部 平蔵 Hattori Heizō), known in the Funimation dub as Martin Hartwell, is a character in the manga and anime franchise Detective Conan. Heizo Hattori is the highest ranking officer at the Osaka Prefectural Police Headquarters; he is Superintendent Supervisor (Rank 2). Heizo is the father of the high school detective Heiji Hattori, and is sometimes very supportive of his son's desire to be a detective. Heizo has sometimes lent his son a hand in solving a tough case. Though he has a hard exterior, Heizo is very caring for his son, family, and friends. At the Osaka district, he is very close with Goro Otaki and Ginshiro Toyama. It is due to his friendship with Ginshiro Toyama that his son, Heiji, originally met Toyama's daughter, Kazuha. His wife is Shizuka Hattori. Ginshiro Toyama (遠山 銀司郎 Tōyama Ginshirō), also known as Chief Thomas in the Funimation dub, is a character in the manga and anime franchise Detective Conan. Toyama is the Chief Criminal Investigator (or Chief Detective) in the Osaka police district, and is close friends with the police chief of Osaka, Heizo Hattori. It is due to their friendship that Toyama's daughter, Kazuha, met Heizo's son, Heiji. Very little is known about Detective Toyama, though his first name was finally revealed in The Lost Ship in the Sky. Little is known about Detective Toyama's past. Fans originally speculated as to whether Kazuha's parents are divorced or her mother has died, as her mother remained unmentioned until well into the series. 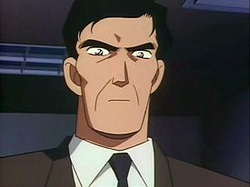 Goro Otaki (大滝 悟郎 Ōtaki Gorō), also known in the Funimation dub as Inspector Odin, is a character in the manga and anime franchise Detective Conan. Otaki is the head inspector of the Osaka district, and good friends with Heizo Hattori and Ginshiro Toyama. Otaki is also close friends with Heizo's son, Heiji, whom often calls Otaki when he needs to find information for an important case. Sometimes, Otaki even assists Heiji, and has a few times before lent a big helping hand in helping Heiji and Conan solve cases.